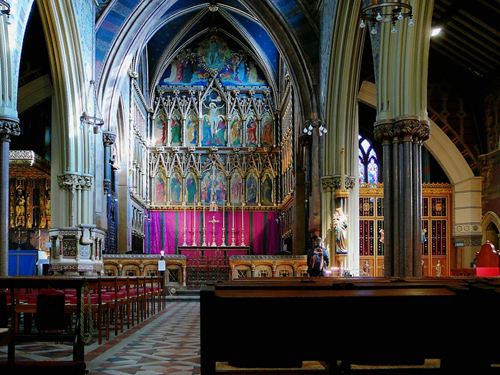 All Saints, Margaret Street is an Anglican church in London built in the High Victorian Gothic style by the architect William Butterfield and completed in 1859. All Saints is also noted for its musical tradition. The organ, built in 1910, is a four-manual Harrison and Harrison instrument with 65 speaking stops. Until 1968, the music was provided by a choir of men and boys, which was called upon to sing at the coronations of Edward VII, George V, George VI, and Elizabeth II. I was asked to measure the painted organ pipes to reproduce the paint colours, which Papers and Paints then mixed.